…How your timpani has gone from sounding good to bad. My intention with this article is to explain how your kettle drum works acoustically to create a harmonic pitch. I have simplified everything considerably for clarity and brevity. Once the fundamentals are understood you will then be able to find out what has happened to your drum, and come to the realisation that you really do need expert help! Right at the very beginning, Preschool Paul, whilst out walking with his parents threw a stone into a pond and watched the ripples. Because this pond just happens to be perfectly round, the ripples bounce back off the banks uniformly. It creates a nice symmetrical pattern. When applied to your kettle drum, this would represent the perfectly pure note. The stone represents the timpani stick and I know a timpani is played at the edge, but that is because of more advanced acoustical reasons which do not contradict this acoustic model. The ripples are sound waves. However, if the pond was elliptical then some sections of the circular sound wave would be reflected off the bank before other sections. 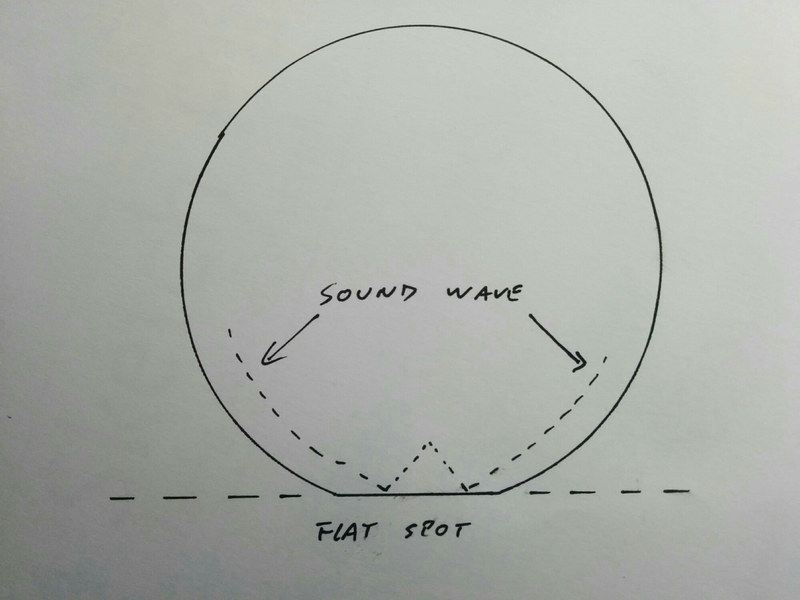 Your drum now sounds awful because the interaction between the original and reflected sound waves are inharmonic. (This will be explained in another article if I ever finish it!) The same thing would happen if your timpani bowl has been squashed and you have a flat spot. However it gets more complicated, because we live in a three dimensional world. In the diagram below, the drum looks circular when viewed from directly above, but as the image rotates around the centre line as if to view the bowl from the side, it can be seen that the top half creates the expected ellipse, whereas the bottom half undulates up and down. This could be because something has dropped onto the drum from above. At the bottom left you can see the “acoustic” shape that this bowl would create. Because the bowl shape doesn’t vary when timpani are played, then any defect in the roundness of the bowl will affect the entire playing range. 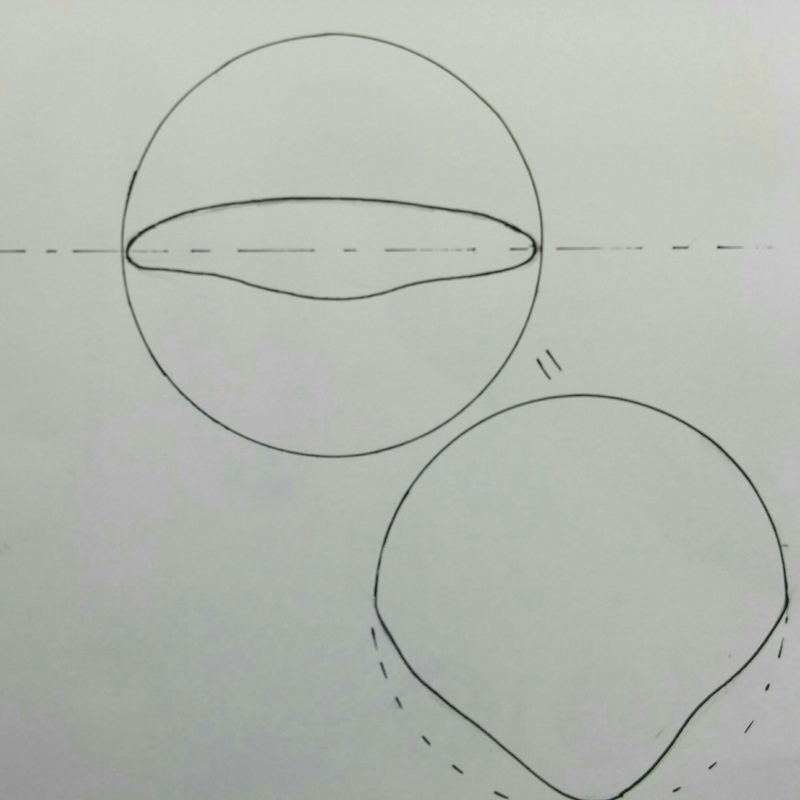 It is relatively easy to return an elliptical bowl back to round – I do it every time I change a head, however if the bowl is egg shaped things suddenly get harder, and if it’s not flat they become harder still. Timpani don’t just play one pitch, they have pedal mechanisms that adjust the tension of the head. Now we know how to get a good note, it is easy to understand that if the tuning linkages are pulling one part of the head harder than another, then acoustically, this is like changing the shape of the bowl away from circular and harmonic. This manifests itself when the kettle drum sounds good at one pitch, but gets worse as you move away from that pitch. However, timpani always sound better at lower pitches, so a 26″ will always start to sound a bit iffy at higher pitches because they are no longer capable of working properly from an acoustical stand point, and anything smaller just doesn’t work. As players, you will probably agree with me in wishing that composers would stop trying to get timpani to play top A’s and above – they would be better using a roto-tom!